Schnappen Sie sich ein kaltes Getränk, treten Sie die Füße hoch, sitzen Sie auf dem Deck dieses neu gebauten Hauses direkt am Fluss. Alle Ihre Sorgen werden wegwaschen, während Sie die Aussicht auf die Berge und die Geräusche des Flusses auf Ihrem Urlaub in Montana genießen! Dieses schöne und neu gebaute Haus liegt am schönen Yellowstone River, etwa 20 Meilen südlich von Livingston. Saubere, helle, neue, offene Grundrisse sind ideal für größere Familien oder kleine Gruppen. Endlose Angel-, Wander- und Erholungsmöglichkeiten liegen direkt vor Ihrer Tür. Sie können Fische aus dem Hinterhof fliegen! Das Haus verfügt über 3 private Schlafzimmer und ein großes Familienzimmer / Loft mit einem großen Futon. Es gibt ein zusätzliches ausziehbares Queensize-Bett in einem zusätzlichen Zimmer auf der Hauptebene. Das Wohnzimmer und die Küche im Erdgeschoss bieten einen atemberaubenden Blick auf den Yellowstone River (nahe genug, um einen Stein zu werfen). Dieses Haus fühlt sich an wie zu Hause und ist sehr einfach zu leben. This home and location is perfect if you're looking to be somewhere in between Livingston and Yellowstone National Park. The home is beautiful and clean and the property manager is a pleasure. Stunning views of Emigrant Peak and Yellowstone River. We didn't catch any fish from shore but saw a drift boat angler catch a large Brown Trout in the deeper water. It's the perfect place to sit in the sun and enjoy the views and sounds of the area. We watched the Osprey fishing every day and saw pronghorn antelope on the hill behind the house. We will rent this home again the next time we are in the area. It is such a special place - thrilled you were able to make memories! Great....right on Yellowstone, house was very well equipped. Was a little too close to highway..noisy. Thank you Denise! The home, while convenient to accessing the road can sometimes be a little noisy, but easy to be distracted by those views and time on the River side of the home. - thanks for your feedback. We had an amazing family time at River Run. The property was clean, well stock and very comfortable for our family. 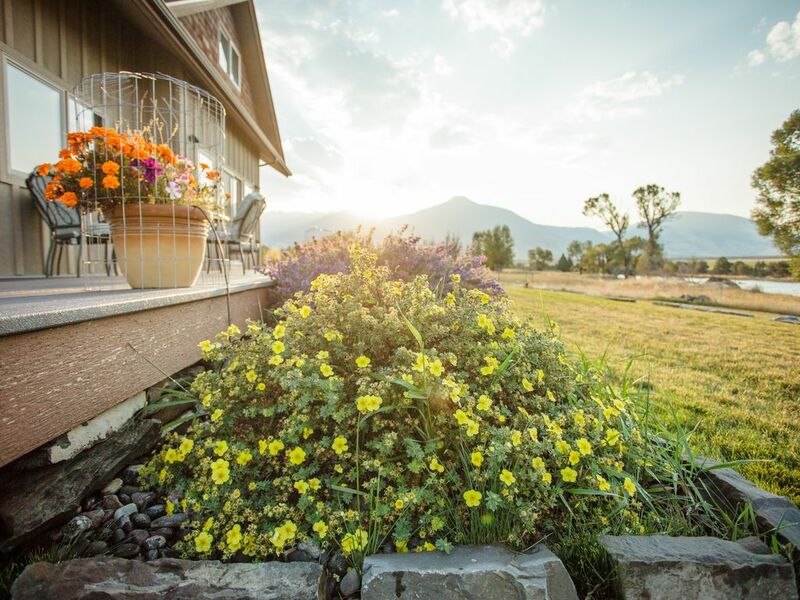 The views of the mountains and the Yellowstone River are amazing from the deck. We were very pleased with everything. I did have to contact manager and she was very prompt to respond to my question. We are hoping to be able to spend time here again one day! We hope you come back and are always happy to respond quickly with any questions! Thanks for staying with us. Great time at River Run Home! This was our third year at River Run Home and, again, it was a wonderful week. The house is beautiful and well equipped. It has different areas where people can have their own space or be together. Sitting on the porch and viewing the Yellowstone River and mountains is very relaxing. The location is excellent to make trips to interesting towns like Livingston, explore the mountain roads, or visit Yellowstone Park. It is a great getaway! Thank you Barbara for always being such great guests. We love having you! To have your children and grandchildren together for one week was a great treat. Then to have the house for another week with just my husband and I was icing on the cake. The property is an excellent environment for outside fun for the children, fishing at our back door, deck relaxing and watching the wildlife. Then there was the the fun we had exploring the area: Yellowstone, Emigrant bar b que, fun restaurants in Livingston, and white water rafting in Gardiner. The property was very cleaned and well maintained with flowers off the deck. The manager were right there when there were questions. Please take advantage of this beautiful home and bring the family. Thank you! It is a great place for families and children! So much to explore! Gorgeous property right on the river!! We had our wedding party stay here and it was perfect! Quick access to the highway as well as riverfront access, was the best of both worlds!! Perfekte Lage, wenn Sie vorhaben, auf die Erforschung Paradise Valley - Sie sind zentral gelegen zwischen Livingston und Yellowstone National Park entfernt und sind direkt am Yellowstone River! Special fly fishing packages are available, please inquire.